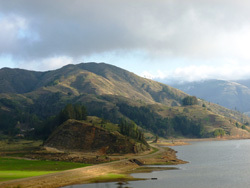 We’re off for Cochabamba, Bolivia. At about 8400 feet elevation, this city of 800,000 people is situated in a fertile valley about 2/3 up the Andes Mountain range. About 1/2 the people speak Spanish. The others speak native Quechuan or Amayran. The indigenous people are descendants of the Incas. Why Bolivia? 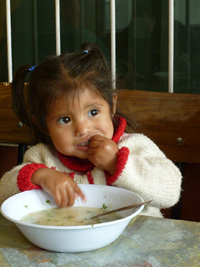 Ten years ago we started sponsoring 5 year old Daniela through Compassion.com. That started turning our hearts to that poor country. The last few years we’ve asked God to open our eyes so we can see the world more as He sees it, that our hearts would break for the things that break His. 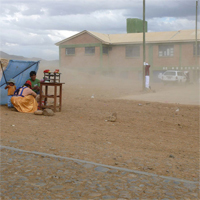 In this time, we have been increasingly drawn to the Bolivian people, some of the poorest in South America. 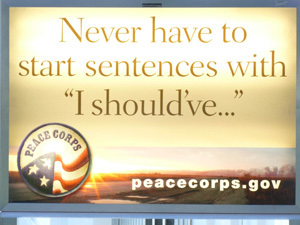 In the Des Moines airport, everyone speaks English. In the Chicago airport, some speak Spanish. In the Miami airport, it seems everyone speaks Spanish! 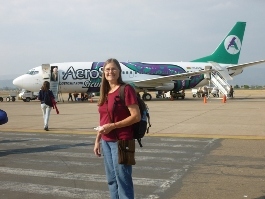 There was a little mix-up at the Miami airport; they had me going to Bolivia, but Marcia going to Argentina! After exchanging some embarrassed smiles, we got that resolved. We knew we were in real trouble when once aboard the flight to Bolivia, we found we could not understand much of what the pilot was saying. I was even more concerned when Marcia told me that he was speaking ENGLISH. What followed in Spanish was one long blur of words or maybe one long four minute word! One of my favorite movie lines came to mind: no creo que estamos in Kansas ningun mas. (I don’t think we are in Kansas anymore!) But just like the walk of faith, “No Volviendo atras.” (no turning back). Thus begins this great adventure of faith. We appreciate your prayers more than you can imagine. We believe those prayers will accomplish what mere hands and feet cannot, alone achieve. Whether overseas or over your kitchen table, you too can Go Light Our World! Be blessed in living a legacy life. 4:45 a.m. Touch down, La Paz, Bolivia! At 13,000 feet elevation this is the highest capital city in the world. We can tell the air is thin here. They leave the airplane doors open while they conduct a one hour security check and we are not allow to disembark. I think they are searching for all the sleep we lost on the overnight flight. At 6:30 a.m. we depart for Santa Cruz de la Sierra. 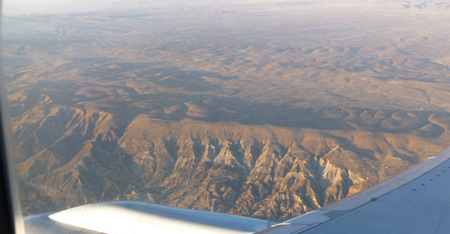 On this flight we get our first view of the rugged brown Andes mountain range. The presence of mountains always seems to help ground me, to see my world in perspective with the larger scheme. It is amazing to consider that God spoke, and these gigantic structures were formed. 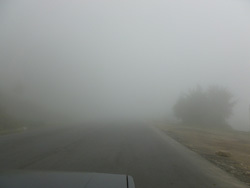 7:15 a.m. We arrive in Santa Cruz, at the base of the Andes and gateway to the Bolivian jungle. It is already 85 degrees Fahrenheit here in early morning in this tropical city of 1.7 million people. The city is organized in a series of concentric circles or ‘rings’. Pastor Luis, his wife Yolanda, and daughter Noelia welcome us with a sign and hugs and kisses and then proceed to spend a day spoiling us as royal guests. Upon visiting their modest home in the second ‘ring’ of the city we learn that 7 other families meet here for church each Sunday and also for prayer and Bible study on other nights. They are looking to rent a church building closer to the North central area of the city where these families live. 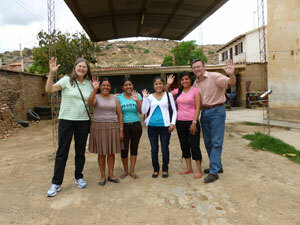 Our hosts are from Peru and are on mission to raise up local Bolivian pastors. In Santa Cruz it seems everywhere there is lots of construction and repair activity but little evidence of much work actually accomplished. It is largely an unkept city and from what we saw there is much poverty. Middle class here offers a much lower standard of living. 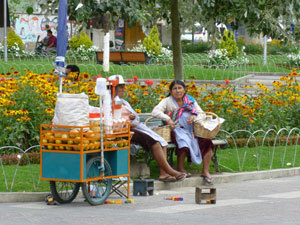 Everywhere you find street vendors selling gum, candy, jewelry and other crafts, tobacco, newspapers, juices, etc. Some have permanent kiosks, others have kiosks on the back of a cart or motorbike. Still others operate out of a cardboard box or a simple mat on the ground. There was a large peaceful protest on the steps of the catholic cathedral. There are also work stoppages/strikes in some cities protesting the Evo Morales government for its support of a large new highway cutting through a national park and rainforest. “It is the cocaine highway” decry the local indigenous people who are being evicted from their homes for the construction of this road. We know to avoid crowds where active protests are in progress and are advised to purchase some groceries in the event of a national strike. Adjacent to this is the spacious Principal Plaza which is a beautiful place to gather and meet people. We enjoyed a tour of Noelia’s school which is currently closed due to the epidemic of H1N1 and dengue fever here. 5 people have died this past week due to this outbreak. At La Casa de Camba we enjoyed a sumptuous dinner that features local foods from the plains, the mountain valleys, and the jungles of Bolivia. We enjoyed Locro de Gallina and Cordero al Horno-Brazuelo. We made a mad dash to the airport through much traffic where there is seemingly no organized pattern of driving. The largest vehicles and most bold drivers win out in this race which is accompanied by much honking of horns. At the airport we learn that our flight has been again changed back to it’s original time, so we can again wait. We pay our airport departure tax, and say good bye to our wonderful hosts with hugs and kisses as we prepare for the final flight in this journey to Cochabamba. There are two ways to learn to swim: 1) tiptoe in ever so gradually or 2) jump right in the deep end. Either way you are going to get wet. Today was a day of jumping in. Our brains hurt after a full day of interacting with people who don’t speak English while we don’t really speak much Spanish. Our guests were most gracious and we all ended up laughing at our attempts to communicate. In the end we all managed to quickly bond, which is our primary mission here. Our night flight up the mountains to Cochabamba was short and pleasant. Pastor Moises and his wife Kely and our guardian angel Julia and two others from the church greeted us at the airport with big smiles and hugs and kisses. They drove us into the city of Cochabamba, a ‘town’ of 800,000 people and our home for the next three weeks. 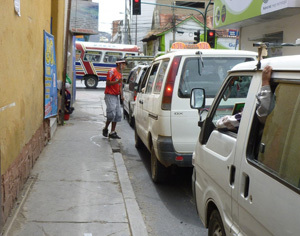 In this short journey we learn more about Bolivian driving where green means GO, yellow means HURRY, and Red means PROCEED WITH CAUTION AND MUCH HONKING OF HORNS! After a quick tour of our new home at the New Tribes Mission compound we went out to eat for an evening of much laughter, delicious Bolivian food and wonderful company. Even though only three of the six of us spoke English it was as if we were old friends at a reunion. We returned to our room exhausted but also encouraged. Awakened by peacocks next door. 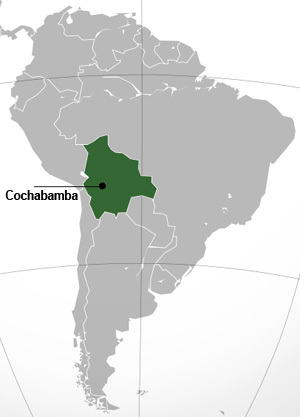 Cochabamba (CBBA) is called “the city of eternal spring” because of its temperate climate. It is a cool 72 degrees here but the sun is quite strong. Palm trees, hibiscus, and trumpet flower are plentiful. The CMA Church is located downtown on a very narrow street. There are two main buildings in the compound that house a variety of ministries. They provide childcare to approx. 70 children daily. 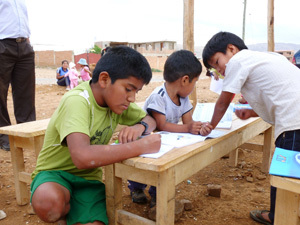 The classrooms are modest but very colorful and the teachers are attentive and compassionate. 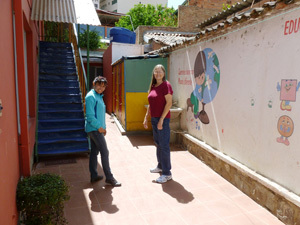 They have showers for their Josias ministry in which they reach out to the street children of Cochabamba. The routine is “shower first, then food.” (more on this vital ministry later) The sanctuary is a multipurpose room used for worship, prayer, discipleship classes, and other functions. Marcia instantly connected with Phoebe, a missionary from Brisbane Australia, who has been here for 47 years. In CBBA there is much construction. We are told it is not so much a sign of good economy as it is of money laundering from cocaine trafficking. Numerous high rise apartment complexes are being built, apparently by hand…we saw no construction cranes. 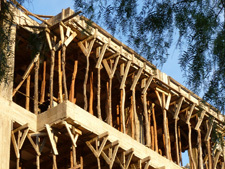 They pour formed concrete and support it with strong tree branches until the cement cures. Then the walls are built of brick and covered with a cement stucco. Building regulations are either nonexistent or not enforced. We see other examples of this: seat belt use is not enforced and it is not uncommon for children to be held in laps in the front seat. There are 8 in our tiny VW Santana today. 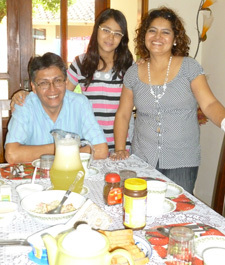 We enjoyed a wonderful lunch at Pastor Moises and Kely’s apartment after picking up their two girls from school. Julia helped us with translations since the Diaz family does not speak English. 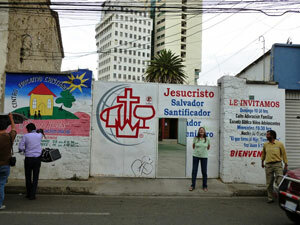 We later met with Hilarión at the church to discuss our Spanish lessons. 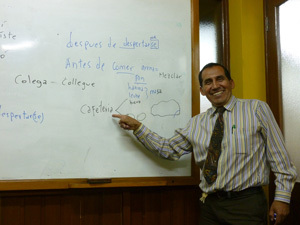 Hilarión runs a language institute downtown where he and other instructors teach English, Spanish, and native Quechuan. Hilarión will be our private instructor in the weekday mornings. We make frequent mistakes in Spanish. For example I was talking about stars that a child had drawn but instead of the correct word estrellas, I said strillas, which I’m told means stretch marks…not quite the same thing! It is always a bit dangerous to talk about cacahuete mani (peanut butter) but more especially if you are misunderstood to say alcahuete which is a term for an immoral business. Be careful little mouth what you say! We took our first venture to the market tonight with the assistance of a missionary from Switzerland and a local missionary from Bolivia. We awoke again to beautiful Cochabamba skies and song birds. Internet is slow, if available. High speed Internet here is 1-2 Mb compared to 12-20 in Newton, so updates are delayed. Coca tea is supposed to help with altitude adjustment. I find it is a weak clear tea with little taste, and little obvious benefits, other than it keeps you wired at night. In our first Spanish lesson, Hilarión helps us navigate the world of banking and transportation. Our assignment is to take two taxi rides and convert US dollars into Bolivianos. The taxi part went okay. Then we notice that all banks have guards at the door with flak jackets and shotguns. We squeeze between two of these men to enter one bank and proceed to the teller window. One of the guard follows us and tells Marcia to sit down…to many people at the window. (turns out this bank was robbed a week or two ago; one person died). I think I am speaking well in Spanish, “Quiero cambiar dolares a bolivianos.” but the young teller laughs as she fulfills my request. Evidently, instead of “dolares” (USA money) I pronounced the word “Dolores” which is pain, and also a woman’s name. Ay yay yay. We enjoyed a nice lunch with our friend Julia and her sister and later tour their Educational Games and Toy store for persons with disabilities. 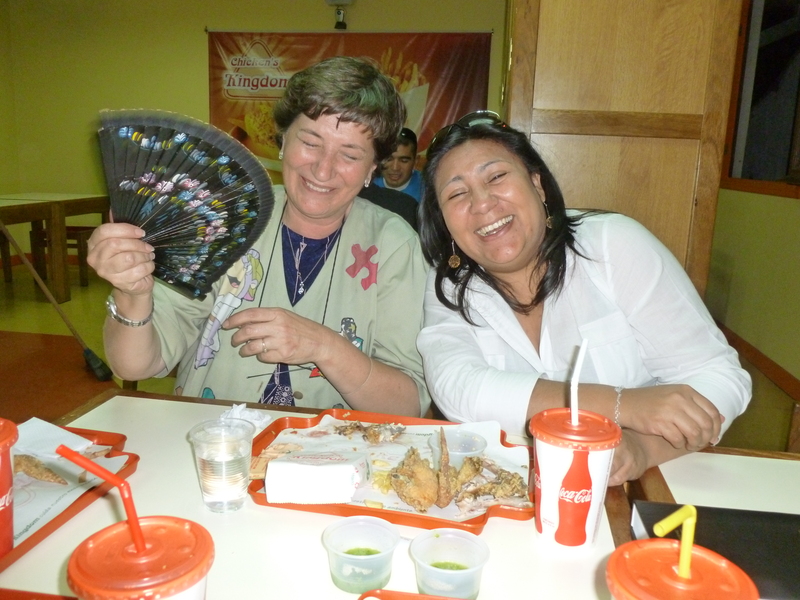 Julia has been our “guardian angel” in helping us prepare for and adapt to Bolivian culture and language exchange. There are strikes around the country protesting the government’s “cocaine highway” being built through a rainforest. Strikes and blockades are supposed to come to our city tomorrow. We will see. Taking a taxi-Trufi to the language institute costs about 50 cents for the two of us. There are numerous others who squeeze into the car with us for this price. A private radio taxi costs about $1.25 and unlike the trufi is not bound to a certain route. On this ride we are reminded that the horn and brakes are the most important parts of a vehicle in Cochabamba. 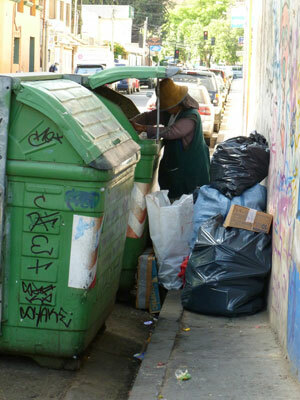 Many indigenous people earn income by collecting trash that others discard and selling this to recycling companies. We arrived early for our Spanish lesson so we had time to walk 6 blocks to see this part of town which is home to printers row. Little kiosks selling all kinds of things and kids cleaning windshields or doing ‘tricks’ for small change are everywhere. 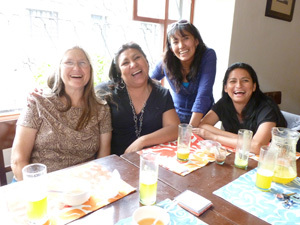 Lunch with three of the ladies from the church, Susie, Delia, and Roxana. None speak English but what a hoot! It has been awhile since we have laughed so much. I told Jane’s chiste (bilingual joke) about the mama mouse and her three babies in Spanish and it was a big hit. These are dear women who show their love for Jesus in very practical outreaches to severely disadvantaged people. Only God can bind hearts this quickly. We walked about 7-8 miles throughout the center of the city and only got lost twice (there are precious few street signs). Compassion International is in the tallest building in the city (owned by the local newspaper). 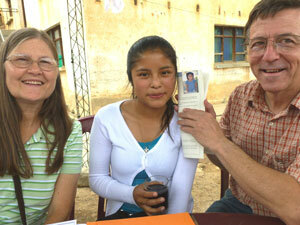 Here we meet young Raquel who is a former sponsored Compassion Child who now is a Compassion employee. She and her coworker ‘Noli’ gave us a tour of the office operations and confirmed our visit with our Compassion child next week. On the way back to the church we encounter a peaceful protest of thousands of marchers speaking out against the government highway. We made small purchases in a number of stores and asked for directions a couple of times giving us more opportunity to practice Spanish. Despite LOTS of mistakes we are gaining confidence in our conversational skills. Instead of taking the taxi Trufi we take a 45 minute walk to the church in the heart of the city. Here we observe the Josias project. There are over 30 children and mothers here today from the very poor Las Lomas de Santa Barbara area in the mountains south of the city (we will go to that village tomorrow). Here at the church they get showers, schooling (reading, writing, etc), a well baby clinic, prayer, and lunch. Young volunteers from the university compassionately offer assistance to everyone. 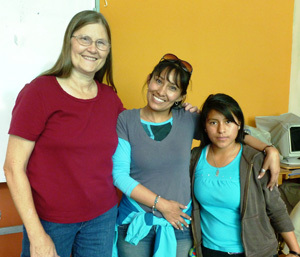 One volunteer, Eva, used to be a project child from the ghetto and is now a leader! It is an amazing picture of compassion and practical love. 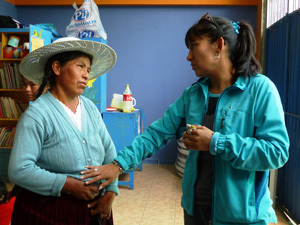 I was asked to pray for the mothers and especially Pauline, a Quechuan woman who injured her eye while chopping plastic (her income comes from recycling plastic she collects throughout the city). Despite my bumbling Spanglish, she tenderly expresses her appreciation. Marcia and I both were deeply touched by Delia’s personal and passionate prayers for each of the mothers, one by one. She encourages them to believe in the power and grace of Jesus, rather than to rely on good works for their salvation. 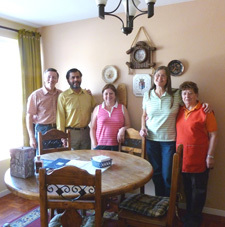 Pastor Moises invites us to lunch again at his house where we meet the pastor from the Quillacollo church where they have asked Marcia and I to speak to the young people next week. 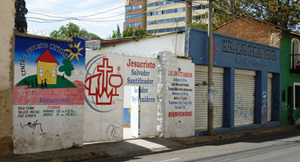 This church was planted a few years ago by the small Cochabamba church. To close out the day, Bryan spoke to the young people of the Cochabamba church on the topic of swimming against the current of temptation. The verses Marcia and I selected were 1 Corinthians 3:10-16, 1 John 2:15-16, and Romans 12:1. Marcia came up with the idea for a great object lesson to illustrate these truths. Afterward, we discover the talk hit home especially with two of the youth leaders. One of them asked to speak with us about how to stay pure and how to lay the foundation for a firm marriage. Throughout this trip I have observed a number of times how much I need Marcia. I am the planner, she is the one to say, “let’s go!” I am more willing to speak publicly but she is much better at listening and understanding the spoken Spanish word. I tend to shut down in large groups where I have difficulty hearing and people are talking very fast. She perseveres. We take turns saving each other at street corners from the crazy rushing traffic. We toured six Sunday school classes, all taught directly from the bible by competent and compassionate teachers, and sat in on the class of adolescents who were very well behaved and very attentive. Ronald’s lesson on ‘clean vessels’ exactly mirrored my message last night to the older youth! God is good! After a quick lunch, we head up the mountain to Las Lomas. Here we borrow benches from the 2 man police station and set them up in an empty outdoor marketplace. About thirty children with runny noses, ragged clothes, and dirty smiling faces quickly show up. To begin the 2 1/2 hour session Pastor Moises leads them in action songs. I can tell he is physically tired and yet his energy and compassion abounds. 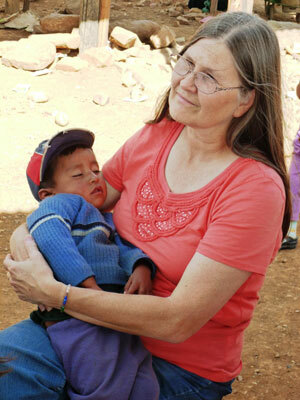 One little boy falls asleep in Marcia’s arms. We are touched by the heartfelt prayers of these little ones for their families. They also listen attentively to bible stories and practice reading and writing, and of course look forward to snacks. This is another weekly outreach of the church. 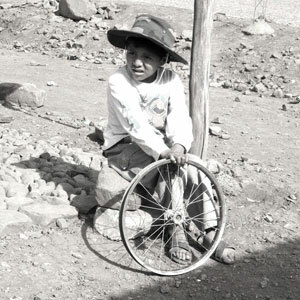 A little boy who is playing with the rim of a bicycle wheel stops by to listen. Leaving them in the good hands of the young people from the church who have come to help, Marcia and I go with Pastor Moises to visit the mother of one of the children in the Josias project. We pass little houses made of adobe and brick, about the size of my living room, or smaller. We learn that 6-9 people, and their animals live in these dwellings with tin roofs held down with rocks and stuffed with grass for insulation. Some have cement floors, some dirt. While there is no clean water in all of Modern Cochabamba, there is no water at all in this village. It has to be purchased and is often stored in rusty and dirty 50 gallon drums. We learn also that in most situations the mom and the dad (if there is a dad present) both have to work, leaving children ages 2 and up to fend for themselves in a dark and dangerous world. With only two policemen, only the most violent of crimes are attended to. We meet with Primitiva, Yovana’s mother and learn that mom and dad are caretakers of the school where 970 children attend, only 1/2 day each. To our horror Primitiva tells us that one of the government provided teachers has abused some of the children. We pray with her and wonder if there is no end to the amount of suffering children must endure in this barren land of rocks and dirt. In the face of such seemingly overwhelming conditions, it is tempting to think that prayer is not the valiant powerful tool it really is. But we leave recognizing that this little light encourages a burdened mother, who knows that God loves her and that others care for her and her situation. Returning to the children, we find them happy with their diversion and several are proud to show us their papers of drawings and writings. I wonder if this generation, with the practical help from the church will be able to leave this forsaken ghetto town. Once back to the church, we ponder how we in the USA have so many resources and blessings and others do not…and how we must rearrange our lives to bring light into darkness…while there is still time. We generally take a taxi trufi to our Spanish class which is the southern most point in the city as we are advised to travel, due to safety issues. Today we studied irregular verbs. Is it just me, or do they all seem a bit irregular? After class we walked to Julia and Pilar’s shop and after a nice lunch at a local cafe, we toured a sample apartment complex across the city to get an idea of costs and provisions of living here. The twelfth floor has an outstanding view of (part of) the city. The Christ statue on the hill (Cristo de la concordia) is a little taller than the famous one in Brazil and is a bit higher elevation too. We are currently living in a mission compound located at the left side of this picture. 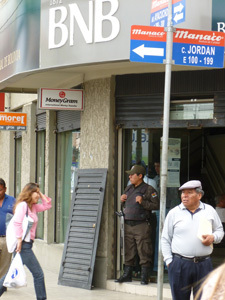 We are told that Bolivians prefer to buy their apartment rather than rent. 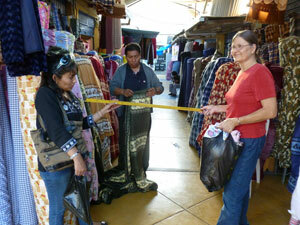 Here in Cochabamba you sometimes have the option of purchasing via anticredito. With this option, the buyer gives the seller the agreed upon sales price for a given period of time (e.g. Two years) and the seller invests the money. The money is then returned in full (less gains on investments) at the end of the period. We walk back home, winded still, but pushing forward always. 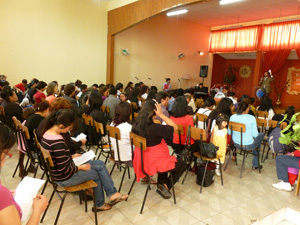 In the evening we attended Pastor Moises’ class on Christian Service. This is one of four classes offered at their Monday night Bible Academy. This inner city church provides many outreaches and growth development opportunities with very few resources. The emphasis is clearly on the ministry and not the buildings. Here are some pictures (Christian graffiti just outside the gate, the entrance to the church compound, courtyard, and the sanctuary. Not pictured, humble kitchen area and several classrooms). There are markets everywhere in Cochabamba; it seems everyone has something to share, whether it be a stand full of fruit or three papayas, or a variety of gum and candy in a cart or hand crafts displayed on a rug on the sidewalk. Today we did a quick walk through the 25 de Mayo market before Spanish class. It is a large flea market with narrow aisles and tons of stuff ready to be peddled to anyone passing by. On our way to class we come across a parade promoting environment and health issues. After Spanish class we walked to the church to meet Moises and for $1 we purchase a beautiful bouquet of flowers for his wife. Lunch with the Diaz family is always a treat for company and food! 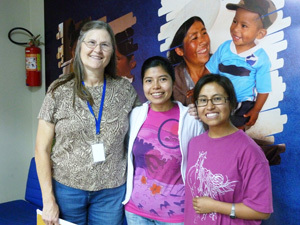 Wednesday 12 October 2011: Meeting Daniela – Our Compassion Child!! One of the reasons we are in Bolivia is because we started sponsoring a child ten years ago through Compassion International. Compassion provides education, food, social and spiritual guidance to support children and help lift them out of poverty situations. 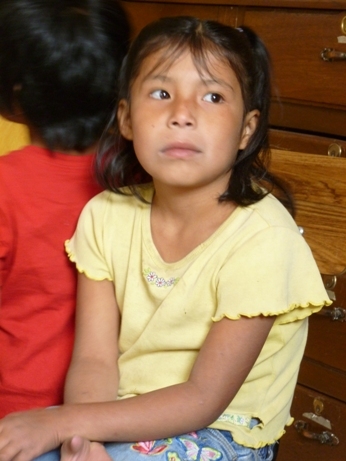 Daniela was 5 years old at the time we started sponsoring her. 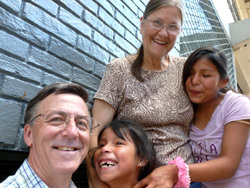 After ten years of writing to Daniela and praying for her and her family, our hearts became increasingly sensitized to the plight of the people of Bolivia. Today, after a long walk to the Los Tiempos building we finally meet Daniela. Daniela is a very pretty and timid 15 year old girl. Her manners are impeccable. But what we notice most is that Daniela is SMILING! In ten years of pictures we have never seen her smile. Today Daniela has a sweet smile that brings a special light to the day. Together with the interpreter and Compassion worker, we take a taxi ride 4km to the outskirts of the city where Daniela and her family live. 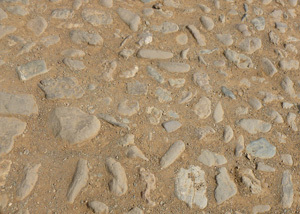 Streets in her community are cobblestone and buildings are adobe or brick. 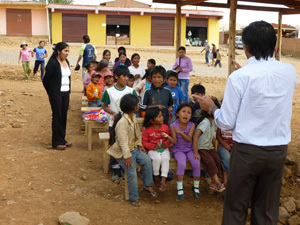 Arriving at the Compassion student development center we are greeted by her class who sing to us in Spanish, Quechuan, and English. We participate in a game called La Rey Se Pide…in this case, The Queen Asks. Daniela is the queen for the day. The group is divided in teams and when the queen asks for an item, the teams each send a representative running to present the item to the queen. Points are awarded to the team to be first to give the item to the queen. It seems like a simple game for adolescents but these teens had lots of fun with it. It makes we wonder how fast we encourage teens to grow up in the USA. We eat lunch with Daniela at her school. This is a time when your mind contemplates the safety of eating food prepared in less than sanitary conditions and your heart leads you to eat what is generously offered so as not to offend. The meal of soup and rice is quite fine. Actually we have had minimal digestive problems during the trip. We walked down the steep hill to Daniela’s house where we meet her mother and two of her sisters. Of course there is no water. This must be purchased from trucks and stored in 50 gallon drums. We enjoyed a nice visit and much laughter with the family. 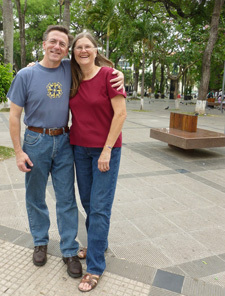 Marcia and I were able to speak Spanish for the majority of the visit. It was funny to hear the translator translate my Spanish into…Spanish! What a hoot. She usually said exactly the same thing I did…without my Iowa accent! We showed Daniela the ten years worth of letters we had received from her. She ran to the house and came back with the ten years of letters we had sent her. They are especially interested to see the comparison of Daniela with the picture we first received of her when she was 5 years old. 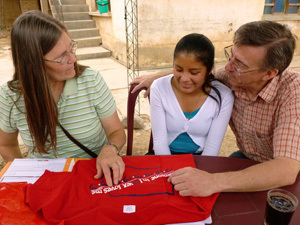 Daniela and her family open the gifts we brought and express their appreciation. We explain to Daniela in Spanish that her shirt says “Someone in Iowa Loves Me” and tell her how special she is to us. Daniela’s father died in an accident a few years ago so you know I enjoyed being papa for a day. It was a wonderful day of many hugs and smiles, laughter, and love that transcends language and custom barriers. Before we leave the family invites us to a picnic sometime before we leave. We said fond farewells until that event can be arranged. You can visit www.compassion.com to learn how you can light our world and that of a child around the globe for less than the cost of a daily latte. Beyond the romance of adventure: One thing I have noticed in taking mission teams to New Orleans is that in preparing for the trip there is a certain excitement and anticipation that sometimes is contrasted with the stark reality of the difficulties of the mission. There are adjustments to cultures, sanitation standards, unpleasantries of many kinds, hard and tiring work, safety concerns, and relational challenges. I think the shock is particularly noticeable if the focus is on accomplishing works rather than on letting God build relationships. Today I hit the wall with regard to adjusting to the thin air, resulting in little sleep and consequently hypersensitivity to the constant and piercing noise of the city. I recognized it immediately as did Marcia. I’m so thankful I have her here to help me seek God’s guidance through this difficult day. We met with Delia today to make our first trip to La Cancha market to purchase material for the mamas of the children in the Josias project. 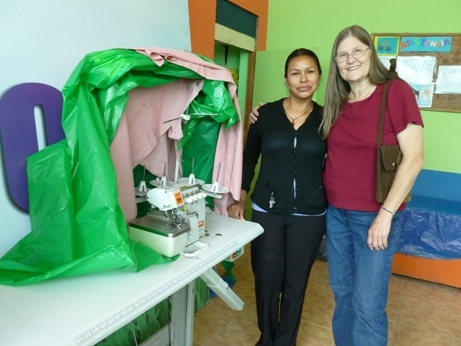 The material will be used to teach the moms to sew and earn needed income for their families. We discussed four phases of this endeavor which will culminate in providing microloans to some of the mothers who have the interest and ability to create their own business to help lift them out of poverty. On Friday we attend our regular morning Spanish class with Hilarion before heading off on a visit wtih Delia at her father’s house in the country south of the city. 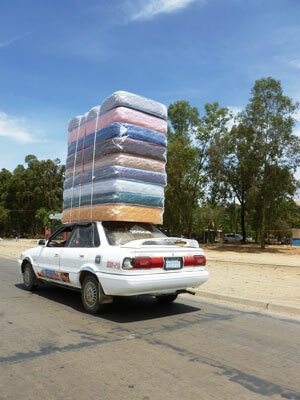 On the way we catch a glimpse of someone who has just purchased several mattresses. We see again the stark contrast of living standards in Cochabamba. After evening worship, we go out to eat with friends. Here is a picture of Julia and Sussi getting a laugh at my expense. I was relating the story of how Shannon would cook for the mission teams when we went to New Orleans. But instead of concino I said comio….basically saying that Shannon would EAT our mission teams. Oh my. Sorry Shannon! Sometimes we think we are making great progress with our Spanish and other days . . . well I guess they are just meant to keep us humble and to bring laughter to others around us! 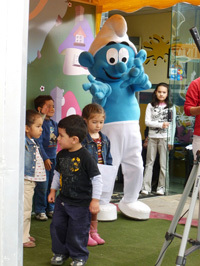 On our walk to the church today we came across this Smurf who was singing to the children in Spanish. On my, even Smurfs speak better Spanish than me! On our second day with the Josias project we help serve lunch which today consists of a delicious soup, rice, vegetables and meat. This provides vital nutrition to not only the little ones but the mothers and one father who attended as well. Afterwards everyone pitches in to help clean up. After cleanup we had time to play with the children. The day proceeds without break from the Josias project to the OANSA program. This is the very same program as AWANAS in the United States. 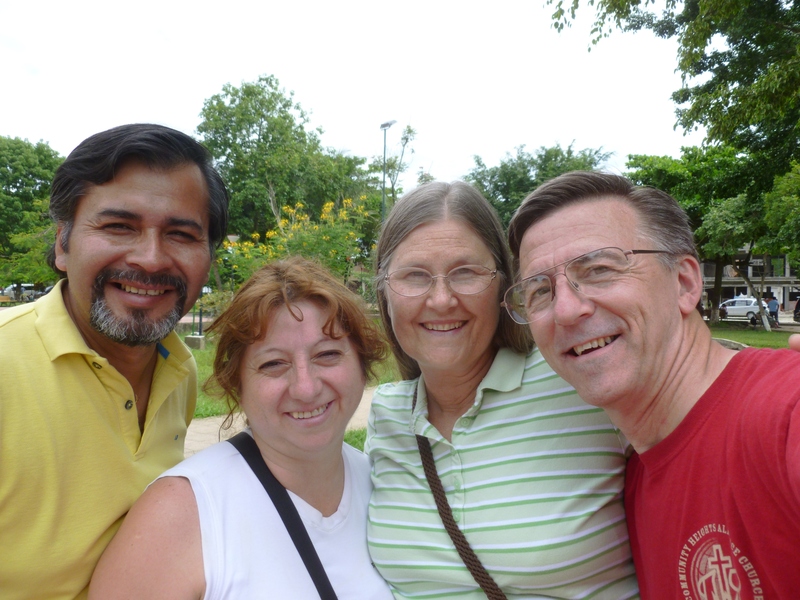 Marcia and I assisted with listening to verses which also helps us with our Spanish too. Good thing we had the books to read what the children were saying! In marathon style, we proceeded directly from OANSA to speak at the youth group of the Alliance church plant in the nearby city of Quillacollo. I adapted the presentation on 1 Corinthians 13 to tie in with their video of the night. God used the message to speak to at least one heart. A long day…sometimes exhaustion is a good feeling. Sunday the 16th…our first day off in two weeks. It is election day for judges and voting is mandatory for everyone. If you don’t vote your assets are frozen for a month or more. Most businesses are closed and only small tiendas are open to sell small meals and refreshments…everything else is closed. What strikes us is the peacefulness of the city. Guards are present to assure that only the few cars with special permission are allowed to use the streets. 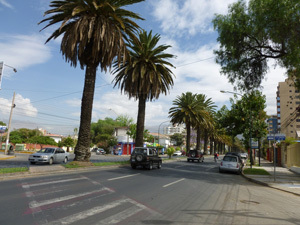 Otherwise the streets are filled with families biking and walking and enjoying a beautiful day in Cochabamba. 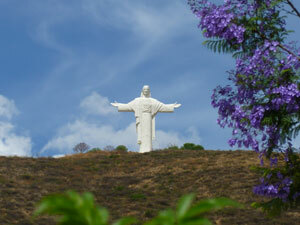 We took a 7 to 8 mile round trip walk nearly to the base of the mountain on which the Christ statue stands. This monument is a bit taller than the famous one in Brazil. 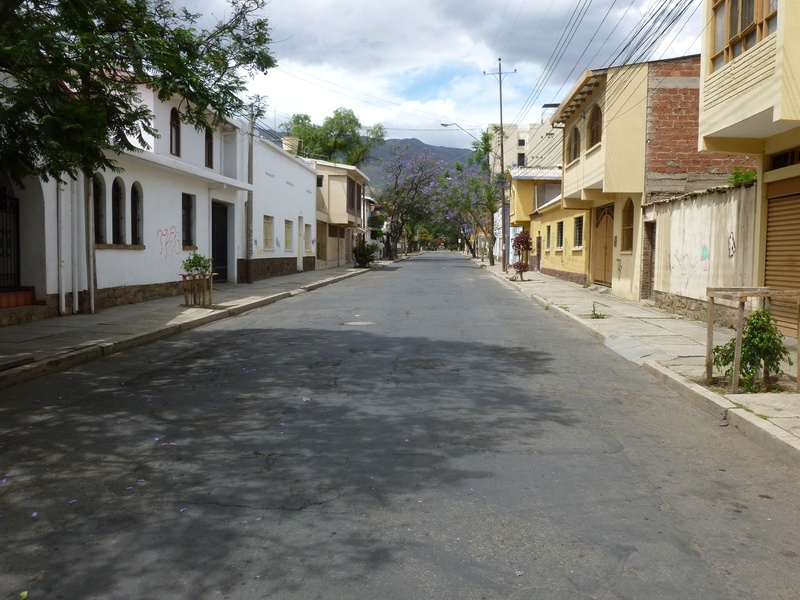 Normally we feel like we are risking our lives to cross the crazy traffic in Cochabamba…today we can walk down the middle of the road. It is a beautiful day. Tomorrow, we head for the district of Chapare, gateway to the jungle for a couple of days R and R and bonding with the pastor and his wife. To get there we will drive across the tall Cocapata mountain range and then take the steep descent to the jungle area where there is steady conflict between the coca growers and the government. Hopefully, our visit will be a peaceful one. Likely, we won’t have access to internet. The guide book sometimes says sometimes the electricity doesn’t work where we are going! Monday-Tuesday 17-18 October 2011: Trip to Villa Tunari. One of the things we have discovered to be of considerable value on mission trips is to STOP working and take time to bond with the pastors AWAY from their mission field. 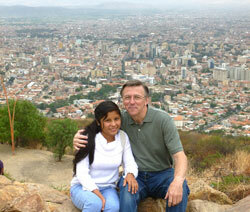 Pastor Moises and his wife Kely both work tirelessly in the Cochabamba mission. And so Monday and Tuesday we took off on a four hour journey across the mountains to Villa Tunari, gateway to the jungle. This is a region of much coca production and often there is much conflict here. But this week it is very tranquil. We stop at a local park for a ‘squeeze’ photo of the four of us. 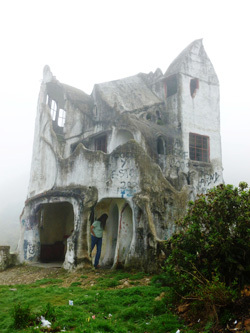 En route to the small town we encountered a Salvadore Dali inspired Bolivian castle…not sure if it is more weird or intriguing. But it begged our investigation. 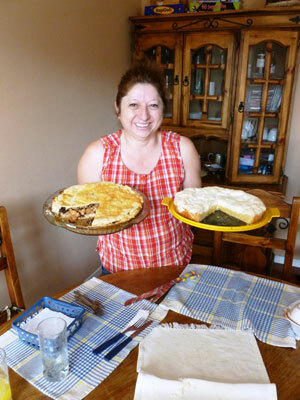 The food in Bolivia is delicious and inexpensive. An evening meal of Surubi cost about $5. Surubi is a local fish. Our steak measures about 7″ by 6″. The full fish is about 5 or 6 feet long! It is VERY tasty! While in Tunari, we hike for several hours in the mountains and find a Caiman *crocodile* in captivity and this monkey in the wild refuge. I am not sure if it is a Cappuccino or Al Pacino variety but it was interested in us. Usually on Bolivian roads my motto is It is a good day to die! On this trip the motto is It is a good day to laugh! …until we start driving again. En route home, we stopped by one of many road side fruit stands. An indigenous woman wanted to sell me a whole group of bananas for $3.50. We were actually in the mood for fresh pineapple so we passed on the bananas. What would we do with 80 bananas! As we rise to the peak of the mountains we find ourselves IN the clouds and I wonder how Moises will see the road ahead of him. Coming down midway we encounter the beautiful lakeside area of Corani. I tell Moises that perhaps we should move there. He says it snows there. 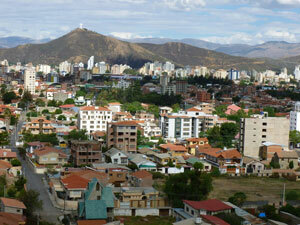 We quickly decide that Cochabamba is a nice place to live. What a great time enjoying life with new friends who graciously forgive our thousands of linguistic mistakes. Marcia came down sick after the jungle trip. We are not sure if it is the sudden altitude adjustment up and down the mountains both ways, or over exertion on the hikes, or something she ate, or something else. She was sad to miss the second visit with our Compassion Child and sent me on as envoy as there wasn’t time to cancel or reschedule. I met Daniela and the Compassion worker at the Los Tiempos building where we all grabbed a taxi to the base of the mountain where the Christ statue stands. We find out the statue is closed today but take a taxi ride to the top where we get a splendid view of the city. She thought it was funny when I started to take a picture of her taking a picture of her Compassion tutor. Daniela is a little bit more comfortable with this visit and it is great to see her smile and laugh. We have waited ten years to see this smile. We enjoyed a nice walk through a park where several universities set up tents to educate passersby about their nursing programs. Daniela toured one of these and together we watched a traditional Bolivian dance. 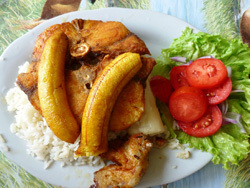 Then she was treated to her, and my, favorite Bolivian dish…Picque Macho. We said quick farewells as she traveled with her Compassion worker to her school where she had a physics test. I walked home to find Marcia a little better, and more improved by evening as I write this. We are humbled and encouraged that in this strange city, she already has a number of people call to check on her and offer assistance. 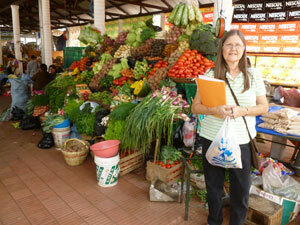 Marcia returned from the jungle trip with severe gastroenteritis that lasted for two days. Actually she is still recovering. I fought it off for about a day before succumbing. We both have started our regimen of emergency antibiotics that we brought with us just for this purpose. We are actually surprised that we haven’t been hit sooner. Interestingly, we believe that our sickness came from one of the nicer cafes in the town of Villa Tunari. (We should have NOT eaten the fresh tomatoes!) 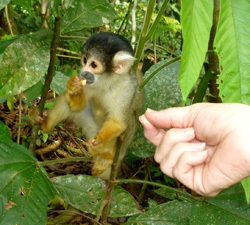 The fever from the contaminated food lasted for a few days, and then with new medicine we thought we were on the mend. Unfortunately, we missed the farewell for us due to continued illness. 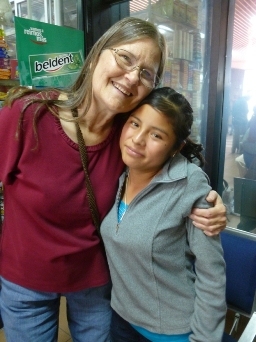 Fortunately, the CMA pastor’s wife in Santa Cruz was able to help us get to a doctor who spoke some English, and she put us both on a whole new regime of medications, which seems to be turning the tide but also causing some other problems. We’ll see the doctor in Iowa when we return. It is a multifaceted problem here in Bolivia and other third world countries I suppose. The degree of education about twentieth century hygiene practices is severely lacking in parts of the population where it is not uncommon for streets to be used as toilets. Compound that with the lack of clean water, and in some cases, no water at all, and the nightmare turns into a vicious cycle. Foods need to be washed with soap and then peeled before eating. But if the hands that prepare the foods are not clean or the water itself is unclean, then assuring food safety becomes a game of roulette. Add to that the facts that there are estimated 500,000 dogs running around the food stands of this city of 1,000,000 and trash is everywhere. The problem compounds. 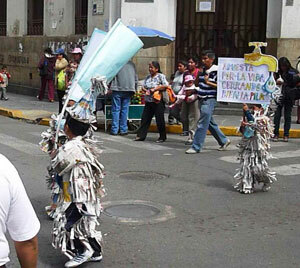 Cochabamba is a city of contrasts, and much of the population is quite modernized in regards to sanitation. Most people use purchased bottled water or filter their water. Most practice good hygiene. But the reality of substandard health practices remains. That is why projects like the church’s Josias program are so important. The practical love of Jesus is shared in the context of education that offers a hope to youth for a life freed from the oppressive chains of ignorance and poverty. That same hope is offered to moms who are learning not only essential health and hygiene practices but also practical means of earning income to support their families. Part of lighting the world around us begins with our own awareness of the plight of others and the willful decision to use our lives in a way that reaches far beyond the safety and comfort of our own world….a way that actively dispels darkness in the lives of others by surrendering our ‘right’ to a life of comfort and ease. Here is a picture of our Compassion Child Daniela who came to say farewell at the airport and Marcia preparing to board our plane for Santa Cruz de la Sierra, en route to the USA. It is impossible to miss the trash that lines the streets, piles of dirt and rocks in every neighborhood and the noxious smells and sounds of the city. The narrow, crooked and upheaved sidewalks that beg to trip those not wary. Graffiti everywhere. And there are the snotty nosed kids with soiled clothes and grimy faces whose eyes twinkle as to say, “Hug me! Play with me. Look into my eyes.” This is a fact of life: when you look beyond circumstances, you may be able to see the world through God’s eyes. Roger and I instantly connected the night I spoke to the young people and Marcia and I connected quickly with his wife and three children. Roger was severely burned in chemical accident 5 years ago and lives a life fully engaged for Jesus. He is a worship leader at the church and Rossemary sings on the worship team. We were humbled by an invitation to his ‘simple’ house as he describes it. Unaccompanied we would not be able to make the evening trip to their part of town. 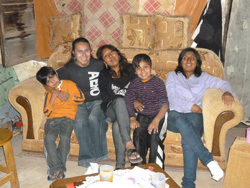 Inside their 3 room home, shared with her mother, there is only great friendship and love. 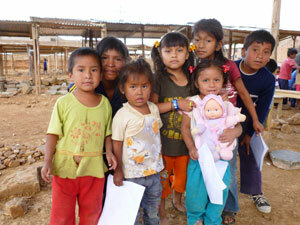 In Las Lomas, children are eager to pray, learn, show affection for each other and to have someone take their photo. As I help the older ones with their math problems I find that these children are smart and full of potential. 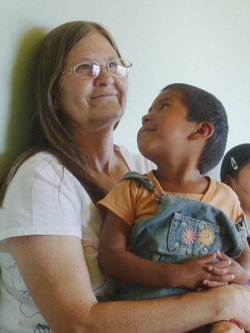 A little girl looks up contented to sit on Marcia’s lap. Sometimes all it takes to bring light into darkness is the simple gift of presence. Before leaving for Bolivia I only told a few people about a dream I had where I felt God was telling me there was a person with vision impairment or blindness that He wanted to heal there. 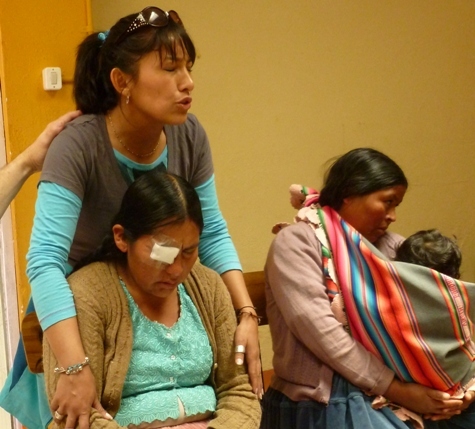 In our first Saturday working with the mamas from Las Lomas, I was asked to pray for Paulina whose right eye was seriously injured by shards of plastic. 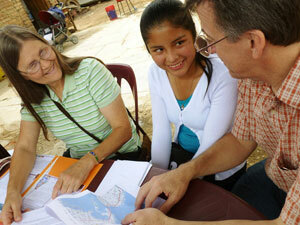 Delia, the project director, informs us that Paulina’s eye and vision were healed by the time we left. Understand clearly, there is no “work” on our part. We are merely witnesses to our great and compassionate God who continues to move in and among us, shining His merciful light to dispel the darkness in our lives. Lesson 10: When sick, go to the doctor! Back in the days of film cameras there was a Kodak commercial that prompted us to capture the “Kodak Moment”…to create a snapshot of that special memory making moment. Over the years, I’ve tried to apply this principle to my life by capturing succinct snapshots of ‘lessons learned’ through special circumstances and trials. 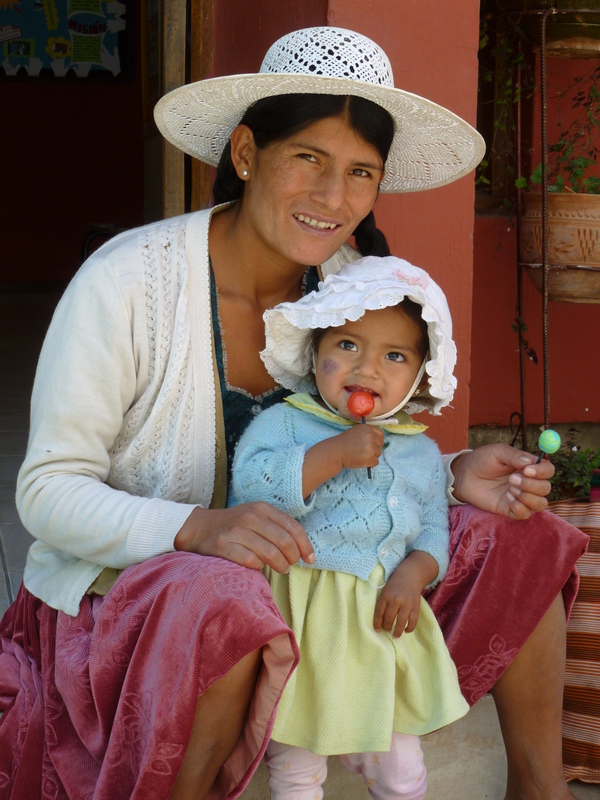 Over the course of the next week or so we will share our top ten countdown of these “Kodak Moments” from Bolivia. Some are more whimsical, others more practical; all are lessons from our memory book. We’ll be blessed if some of them resonate with you as you Go Light Our World. We don’t like to think of ourselves as arrogant North Americans. But when we got sick, our first response was to turn to the antibiotics we brought with us. When those didn’t work, we turned to a well meaning missionary who suggested an alternative medication regime. 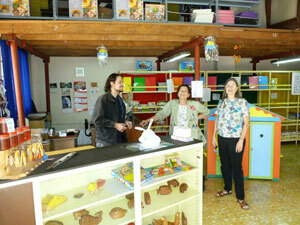 You don’t need a doctor’s prescription in Bolivia; just go to the pharmacy and tell them what you want. We got two differing opinions from two pharmacists. Finally, after a week of illness we did what we should have done in the first place. We saw a doctor. She got us on the right medications and within a day we were on our way back toward better health. However, because the problem had grown for a week, it would take much longer to get our systems fully healed. Spiritually we sometimes do the same thing. We know we have a problem, but turn to our own way of thinking or a friend’s advice before turning to God for His solution. Have you ever stopped to think how all of history would have been changed if Adam would have stood in the gap for his wife when the thing with the apple went down? What if he would have said, “Just a minute mister serpent; let me check with my Daddy about that thought.” True, God gave us hearts and minds to work things out, but He also created an incredible relationship where we can turn to Him anytime about any situation. And in Bolivia we learned again that He is always willing to reveal more of Himself to us…which is just the medicine the doctor ordered for any ailment! Lesson 9: When in a foreign land, build strong alliances. What I’ve learned in 30 years working with persons with challenging and sometimes violent behavior is that creating an environment that is conducive to nurturing healthy and mutually valuing relationships is the key to meaningful success on many levels. In one of the City Slicker movies this is called discovering the #1 thing in your life that matters most. 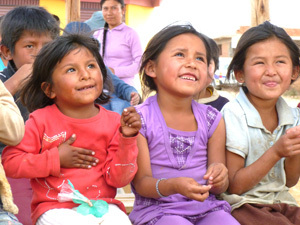 Our mission to Bolivia showed us the #1 thing is relationships.. 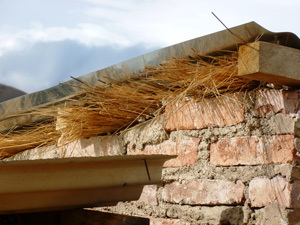 Unlike other mission trips that were focused on building houses following devastating storms, we had one mission focus in Bolivia: build relationships that honor God. But how do you do this when there is such an immense language barrier? We asked God for this one thing and He showed up in amazing ways. We asked God to send someone to befriend us and help us navigate the language problems. He sent us an angel named Julia and her sister Pilar. He quickly cemented this relationship with Julia before we even landed in Bolivia. 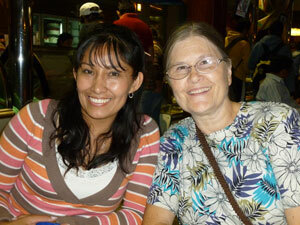 Once in Bolivia, visiting with Julia was like reuniting with an old time friend, even though we had never met before. 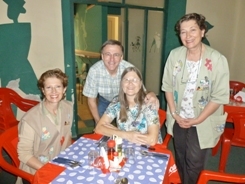 We went to lunch with three young gals from the church who instantly connected with Marcia. Even though they didn’t speak English and our Spanish was extremely limited we laughed and enjoyed an amazing fellowship. (Laughter and encouragement was a big part of our mission.) Pastor Moises and Kely invited us to their home on a number of occasions for meals and we went with them for a two day trip to the jungle. They don’t speak English either but we all enjoyed celebrating life together. I instantly connected with Roger, a young worship leader, even though he spoke so fast I couldn’t understand much of what he said. But from day one, he and I knew we were going to be good friends. Marcia and I both bonded quickly with his wife and young children. And of course, God drew a number of kids to us and us to them. Hearts were quickly joined. When all the money has been made, careers developed, houses built and decked out, yards trimmed, hobbies fulfilled, we all face the same question: “Was it worth it?” In the end, most people I know come to the same conclusion: it is the relationships we make that create a lasting legacy. Relationships made according to God’s plan last forever. It’s always a good day to build and nurture meaningful relationships. 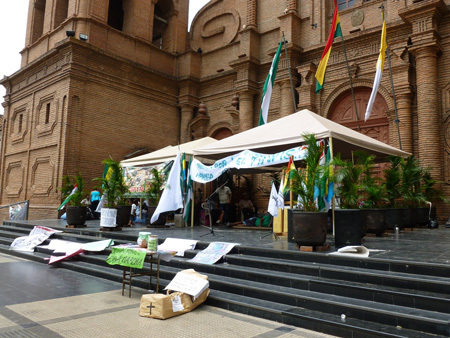 7 November 2011 – Lessons learned in Bolivia. Lesson 8: If you want to know your dependence on God, serve in an area OUTSIDE your area of your gifts and talents. In the movie A Knight’s Tale, Heath Ledger’s character competes in athletic contests while pretending to be a “knight.” He promises the woman of his attention that he will win every contest in order to prove his love for her. And win he does; whether it be jousting, sword fights, or whatever, he demonstrates amazing skill and talent, and emerges victorious in most every battle. But then his true love says that in order to prove his undying love for her he must do what is contrary to his nature…to prove his love he must LOSE every battle. Although confused and angry at this request, out of devotion to his love, the “knight” purposefully sets out to lose each new contest with which he is presented. In the evangelical world there is much talk of discovering and applying your spiritual gifts, and well there should be. God promises spiritual gifts and talents to each believer which we are to use in devotion to Him and for His purpose. We are called to act out in the way He uniquely “wired” us. However, sometimes in this pursuit, we confuse our personal interests and hobbies with spiritual gifts. It is almost as if we are found to say, “I have the spiritual gift of hunting,” or “God gave me the spiritual gift of sports trivia.” Or of gardening, or of house crafts. It is tempting to use our interests to justify our gifts. Regardless of the clarity or confusion one has about their degree of giftedness, God gives us another promise, another gift. It is this: we can always depend on Him. And the truth is that our dependence on God is never proven more than when we have nothing of our own on which to depend. 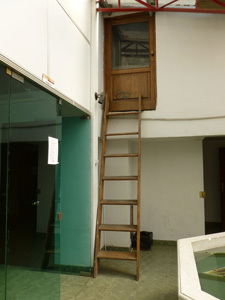 This was the purposeful design of the Bolivia mission. I make my living largely on the basis of my ability to articulate, to analyze complex business situations, and to build and develop self directed work teams. 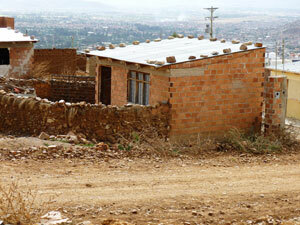 In areas of personal interest, I enjoy mission trips where I can help others build and repair houses and churches. I enjoy gardening. I would have none of those things to draw upon in Bolivia. There was only one mission: build personal relationships that honor God. This isn’t an area of natural strength for me. And how do you build personal relationships in just three weeks? When you really don’t speak the language? Without the context of cooperative work? When you are trying your best just to adapt to a new foreign environment? Before we left, we knew there would be only one solution…depend completely on God. And as you may have read in earlier blog posts, God was completely faithful to provide, above and beyond my personal expectations. A woman healed, a young lady who says her life was changed, a poor family who immediately connected with us, numerous children whose hearts were melded quickly with ours, a quickly budding friendship that seemed more like a reunion of lifelong friends than a first meeting, the rediscovery of how much Marcia and I need each other. .. these are precious gifts from God, and the fruit of a dependent relationship. In a society that touts independence as the goal, perhaps it is time we step out of the mold, and intentionally seek opportunities to develop our dependence on God. In the end, our dependence on God is our only true asset and strength. All other spiritual gifts stem from a life of such dependence. It is the path to experiencing God. And like the young knight in the tale, it is the proof of our heart’s desire. Sometimes we have to relearn lessons that we never adequately applied to our lives. That is the case with this one. 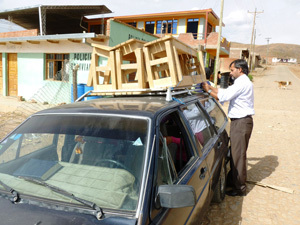 As we wrote in Lesson 8, we went to Bolivia anticipating that we had nothing really to contribute. All we had to rely on was our dependence on God. One of the ways He blessed us was by seeing how He touches others lives not so much by what we do, but simply by the gift of presence. You’ve seen this when comforting a friend mourning the death of a loved one. At a time when there really are no adequate words and even when we FEEL that scripture verses ring hollow, the simple gift of presence blesses and communicates what words cannot. The gift that costs nothing becomes priceless. We prayed once for Deysi and her sisters. Afterward, every visit was a reminder to her that she is special in God’s eyes. This was repeated over and over in countless interactions. In the early days of our mission trip we sometimes felt a bit useless. We didn’t know the routine, our language skills posed a barrier, and we sometimes felt like bumps on a log. (Feelings are not meant to be trusted.) What people conveyed to us was a sincere and very deep sense of appreciation….because we were there. The gift of presence offers hope, encourages, and supports. A friend of mine commented about their family’s sense of busyness: “We live in the little house on the freeway,” he said. We’ve all been there. The gift of presence doesn’t cost a penny but it does cost something. The “cost” is relinquishing our addiction to stuff and busy routines. It costs a selfless moment to be still and know that God is God, and to share this moment with someone who needs the gift of your presence. We’d love to hear your stories of how you’ve seen people Go Light Your World with the simple gift of presence. We’ve always known that encouragement is important. We are reminded to ‘encourage one another and all the more as you see the day approaching.’ (Hebrews 10:24-25) We all have felt the power of encouragement at a time when our own emotional wells were depleted. What surprised us was how important simple emails from home would become. Each day was filled to the brim with a constant bombardment of activities and noises and the repetition of “What did they say? What does it mean? How do I respond.” We ended most days completely exhausted, usually in a good sense, but exhausted nonetheless. On the one hand we felt surprisingly connected to people we had just met. On the other hand, we often also simultaneously felt a sense of isolation because of the language struggles. A small handful of personal emails written specifically to encourage us became prized communications. Encouragement is more than a shot in the arm. Encouragement brings a cup of cold water to the thirsty, it clothes those who feel naked, and it brings friendship to those imprisoned by loneliness. Go Light Your World… it can be done by the simple gift of encouragement. We’re told that a habit can be formed in just 30 days. What might happen if you set up to encourage one person each day for the next 30 days? When planting seeds you can toss them on the ground, water them once in awhile and hope for the best; or you can create a greenhouse that is intentionally designed and conducive to promote and nurture deep growth and fruitfulness. Whether the topic is gardening, the marriage relationship, discipleship, or changing organizational behavior, the same principle applies. The best plan is to create an environment – a greenhouse – that is conducive to positive life change. Two of the storms that wreak havoc with a spiritual greenhouse are the desire to “be our own person” and the desire to compete. Two people madly in love too often fall into routines that typify a numbing coexistence. When this happens they miss the miraculous “two shall become one” promise God offers for their relationship. The relationship is intended to be one of committed mutuality, two people actively supporting each other in their struggles and victories of walking with God. . . the two of them at the same time nurturing the maturity of their relationship just as they would that of a child born to them. I’ve written a number of times in this blog about situations which demonstrated again how much Marcia and I need each other. Yet we both have independent streaks to our nature. In fact, I believe that most the conflict in marriages, big or small, can be traced to this independence. Either the husband is not being the spiritual leader that God designed (one who demonstrates his love for His wife as God loves the church) or the wife desires to lead. The competition for leadership always stifles and complicates God’s very best for any relationship. This is true of course also for those who are not married. Life is hard. And while the promise that God is enough is true, God’s design is that the family of believers bond as a healthy and nurturing family to support and encourage one another. But there is something about learning to cope and to minister to others in a foreign environment that draws us together unlike most challenges we experience otherwise. I think one explanation is the realization of mutual need. One cannot be successful; both are needed to live as one in order to survive and thrive. In marriage or in self directed business work teams, the message is the same: we need each other. I would add to this list, foster the affirmation of mutual need. As one spiritual leader said, “When climbing the mountain of God, we need to hold hands.” Married or single, we need each other and we need to hold in open hands the puzzle pieces that God has given us to share with each other. Prayer is the primary work of God’s people. Prayer? Really? Not serving, not obedience, not giving? How can that be? It’s true because prayer releases God’s power. It’s not that God needs our prayer. After all, He spoke and planets were created. .But for some reason God designed it so that the prayers of the faithful initiate His power. In fact, prayer is more action oriented than everything we do in our own power. But it’s not that prayer accomplishes our desires; it accomplishes the desires of God’s heart as He seeks to reach more and more people with His amazing grace. A lesson we’ve learned through the years and again in Bolivia is this: given the choice of praying for someone and praying with them, choose praying with them. Related to the gift of presence, praying with people is not just about power; it’s about love. I still remember offering to pray for our waitress in Post Katrina New Orleans. Tears filled her eyes, and she asked in amazement, “You’d DO that for me?” In Bolivia, tears filled Paulina’s eyes too, and she didn’t even understand the English words uttered in her behalf. But she experienced the power of love, and later the power of God’s healing. Young Deysi and her sister showed us the power of prayer to instantly create a tie that binds. True prayer goes well beyond asking for stuff. Prayer is an expression of love. And love can achieve in a moment what work cannot in a lifetime. In Tolkien’s Fellowship of the Ring, Frodo is found wishing this trial had not come to him. His mentor Gandalf sympathizes and then offers timeless wisdom for all of us: “All we have to decide is what to do with the time that is given us.” There is a gift of being able to focus on the one singular most important thing. Such laser vision protects against distraction and detours. It provides a clear path for a course charted to attaining the prized goal. It seems to me that children and teenagers ask some of the most important questions in life. Who am I? Where did I come from? What is the meaning of life? Who do I say Jesus is? The wise ones, keep their focus. Too many become distracted with college and careers and marriage and children and house and car payments, and the vision is too often cast aside and lost amongst the busyness of life. Then somewhere later in life, one stumbles across it, like an old treasure tucked away in the attic. And the goal is rediscovered and hopefully picked up for good. When I was a kid we all thought it would be cool to be able to have X-Ray vision like Superman. The gift of focus gives us that sort of super power. It allows us to see through the façade of vanity of living for oneself. It empowers us to see beyond the problems that present themselves and to focus our eyes on what God sees. We see a problem person; God sees someone needing love. We see a dirty neighborhood; God sees an opportunity to build relationships. We see disappointment; God sees His appointment. Beginning and ending each day with quiet time to focus, and listening to what God has to say to us throughout the day allows Him to reveal the great gift of focus in our life. This is one of those paradoxical life lessons: what seems logical is not; what doesn’t seem logical, actually is a better approach. We spoke of this earlier in our blog. Link Jesus taught and lived many such lessons: the first shall be last; it is better to give than receive; He who has found his life will lose it, and he who has lost his life for (Jesus’) sake will find it. The lesson of the comfort zone is like these. There is danger in the comfort zone. 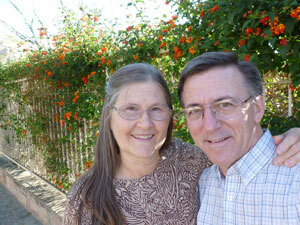 Marcia and I were blessed years ago to know a young Christian couple, Norm and Gelene Klein. We both had young families and enjoyed celebrating life together. Then Norm discovered he had cancer. At one point in his treatment he shared a bold truth. He said that the cancer allowed him to see that he had been previously ‘sleeping’ in a spiritual sense and not living to the potential he felt God was calling Him. And then he added with remarkable confidence that if being cured of cancer would mean falling back into old comfortable ways, then he would rather have the cancer and remain fully awake and alive in Christ. In his final days, it was an honor to maintain prayer vigil at the bedside of this man who realized the danger of the comfort zone. Ed McCully lived this lesson too. While studying to be a lawyer, Ed realized that his life call was not to the safety of a comfortable life but “to live with reckless abandon for the Lord.” In a letter to his friend Jim Elliot he wrote, If there’s nothing to this business of eternal life we might as well lose everything in one crack and throw our present life away with out life hereafter. But if there is something to it, then everything else the Lord says must hold true likewise.” He, along with four other evangelical missionaries (Jim Elliot, Pete Fleming, Nate Saint, and Roger Youderian) lost their lives in the Ecuadorian jungle in 1956 at the hands of the Huaorani people they were trying to reach with the love of Jesus. Later the wives of some of these men returned to that same village and ended up sharing the gospel with the very men who killed their husbands. And God won these souls for all eternity. The films End of the Spear and Beyond the Gates of Splendor document this amazing story of love. Our month trip to Bolivia pales in comparison to these examples. But it was a reminder that the comforts of life do not reveal great meaning or reward. Those are found in pursuing God’s call on your life, despite the ‘costs.’ Some will read this and say, “That’s crazy.” Others will see and respond to a great life truth. It is a paradox: There is danger in the comfort zone. And the ‘safest’ place in the world is in the center of God’s will. Every real belief is matched by action. I believe that ice cream tastes good and I eat it; I believe that anchovies are slimy and disgusting and I leave them alone. You believe a railing is strong and trustworthy and you lean on it; you approach a rusty railing with much caution. We believe that God’s ways are best for us and yet we sometimes act on another belief (a lie) that sin will bring us more satisfaction. We always act on what we choose to believe. One of our primary self-imposed challenges in going to Bolivia was to intentionally engage in ministry in an environment where we would not be able to rely on our own resources, but instead would have to depend fully on God and God alone. During this time we asked God for just one thing: in three weeks or less, help us forge meaningful and lasting relationships that honor Him, despite our language barriers. On the one hand it seems preposterous. On the other hand…we believe that our God is the God who created the universe, the God of all history, the very personal God who gave His only Son so that we could be reconciled to Him, the very God whose greatest miracle is evidenced in bringing our sinful hearts to Him. This is the God who not only moves mountains, He created them. He created me and He created you. As Ed McCully noted in a letter to Jim Elliot, “We’ve already put our trust in Him for salvation, so why not do it as far as our life is concerned?” Makes sense, doesn’t it? If we are to live honest lives of faith, we should simply Expect God. Expect Him to show up. Expect Him to reveal Himself. Expect Him to be consistent with His nature. Expect Him, the greatest promise keeper of all time, to be faithful. Of the top ten lessons learned in our three week Bolivian mission (and there were other lessons too), this was the lesson to rule them all: Expect God in your every day life. Talk With Him and expect Him to answer. Listen to Him and expect Him to reveal His plan, one step at a time. Time magazine has just published it’s “Top Ten Everything of 2011.” This seems to be the time of year when people are especially drawn to such lists. When it comes to the “top ten” things I should do or change in my life I personally I find it overwhelming to focus on ten things. Even Jesus summarized the Ten Commandments in this: Love the Lord your God with all your heart, and love your neighbor as yourself.” That seems to be quite enough to focus on each day, don’t you think? Typically this is how I approach reading books. Most of my books are highlighted with notes in the margin and key passages underlined. With great books, I will sometimes find a couple blank pages the published provides at the end of the book and jot down 2-3 of the most important lessons I want to remember. At the end of the book, I try to summarize these things in 1-2 sentences. These become my daily focus for the next month or more as I seek to apply the truths to my life. 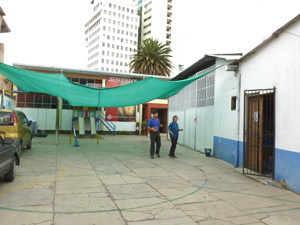 With this in mind, it is with considerable humility that I offer our “top ten lessons learned in our month long mission to Bolivia.” They are in fact lessons for us, thrown up on the website wall as an encouragement and beacon to any others who may hear God speaking similar truths in their life. Some of you have shared affirmation of how God has spoken to you through this. We hope in the future to open up the Stories section of the website to feature your tales of how God has prompted you to Go Light Your World. In the meantime, you can review our Bolivia lessons below and click on a link to review the blog for that entry. I wonder if there might be one particular lesson that speaks to your heart. 10. When sick, go to the one who can heal you. 9. When in a foreign land, build strong alliances. 8. If you want to know your dependence on God, serve in an area OUTSIDE your area of your gifts and talents. 7. The gift of presence. 6. The gift of encouragement. 5. The gift of needing each other. 4. The Power of Prayer. 3. The Importance of Focus. 2. There’s danger in the Comfort Zone. May you find blessing in sharing the Light this dark world so desperately needs.